This mod is a continuation of Qwinn's original PS:T Unfinished Business, based on version 4.12. It has been completely overhauled and made compatible with Planescape Torment: Enhanced Edition in addition to classic Planescape: Torment. The mod is available in English, French, German, Italian, Polish, Brazilian Portuguese, Russian and Spanish. There are several lines and a readme in need of translation into the following languages: French, Italian, Polish, Russian and Spanish. Please shoot me a PM (either here or over at SHS Forums) or post in this topic if you're interested. Of course, more translations are always welcome! PST:EE is also available in Korean and, currently Steam-only, Czech. Important: The current patch version of PST:EE (v3.1.3) contains a bug that resets content, such as stores or areas, when you enter the Modron Maze. To work around this issue, it is strongly recommended to download and install Generalized Biffing as the final mod in the mod list. Note: The mod requires at least WeiDU v243 to be installed correctly. The Windows executable is already included in the mod's zip archive. Linux and macOS binaries can be downloaded here. 1. "All Recommended PS:T Unfinished Business Components"
A convenience option that install all components except "Expanded Deionarra's Truth Mod" and "Restored Item Cheats (Not Recommended)"
2. "Restored Able Ponder-Thought Research"
Completes a number of subjects Able Ponder-Thought will conduct research on. 3. "Restored More Morte Mortuary Moments"
Restores a bit of dialog for Morte in the Mortuary. 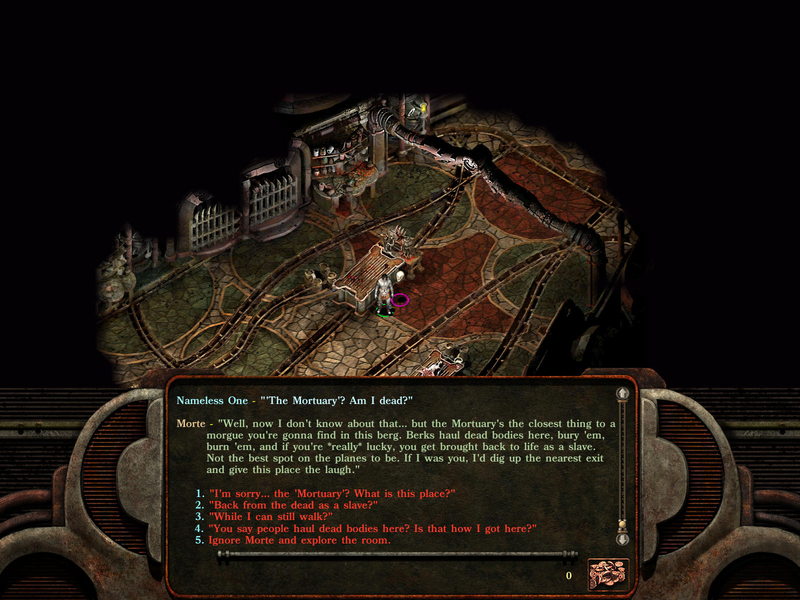 Initial dialog is greatly expanded and more in line with the other conversations in the game. Morte will also trigger a couple more conversations, e.g. when approaching Dhaal's Book. Restores a quest in the Buried Village. 5. "Restored Deionarra's Truth Conversations"
Restores several dialog options regarding Deionarra's fate which are in line with what the player can know at that point in the game. A more complete expansion can be installed by the component "Expanded Deionarra's Truth Mod" below. 6. "Restored Pendant of Yemeth Quest"
Restores a quest involving six actors over two different areas, mostly in or near the Smoldering Corpse Bar. To start it, talk to Ratbone in Ragpicker's Square. 7. "Restored Elyce & Company Quest"
Restores Elyce, her brother and her boyfriend to the game, and there is a small quest involved. Restores seven cool new Curst Citizens with interesting dialogs. Adds 9 more prisoners with their own dialogs to the (originally very sparsely populated) Curst prison. In the original game, you can hire someone to kill Carl Parfidor, but you can never actually meet him. Now you can! 11. "Restored Alley of Dangerous Angles Thugs"
Restores some dialogs and scripts, so that the thugs in the Alley are actually aware of events unfolding around them, will comment on them, and they will no longer be, down to the last man and woman, maniacally obsessed with your 10 copper piece toll. 12. "Restored Morte & Ingress's Teeth Banter"
Restores a very amusing (non-voiced) banter between yourself, Morte and Ingress's Teeth. Before Morte can use the teeth, you will need to use them with Morte nearby. Restores the Fiend's Teeth, Spiked Gauntlets, Gauntlets of Rending, the Eye of Vecna, Devil's Due and the Chaos Feather. 14. "Restored Party Comments and Banters"
Restores 27 fully voiced flirts between Morte and female zombies, which can be enjoyed right at the beginning of the game. Also added are 15 new and entertaining fully voiced banters between various PC's, and a new comment by Grace. The component also restores a new soundtrack that is played in the Smoldering Corpse Bar during nighttime. Finally, talking with your party members will now play that character's theme music, including a new track for Morte. PST:EE note: For technical reasons the component does not restore individual NPC feedback when attempting to open locked doors and containers. The same applies to copying scrolls to the spellbook. It will restore a generic sound effect, however. Restores two significant orphaned blocks of Mebbeth's dialog. 16. "Restored Lower Ward Encounters"
Restores 9 creatures to the main Lower Ward area, including Hailcin'n, a scarred and tattooed githzerai warrior who wanders in the same general area as Kii'na. 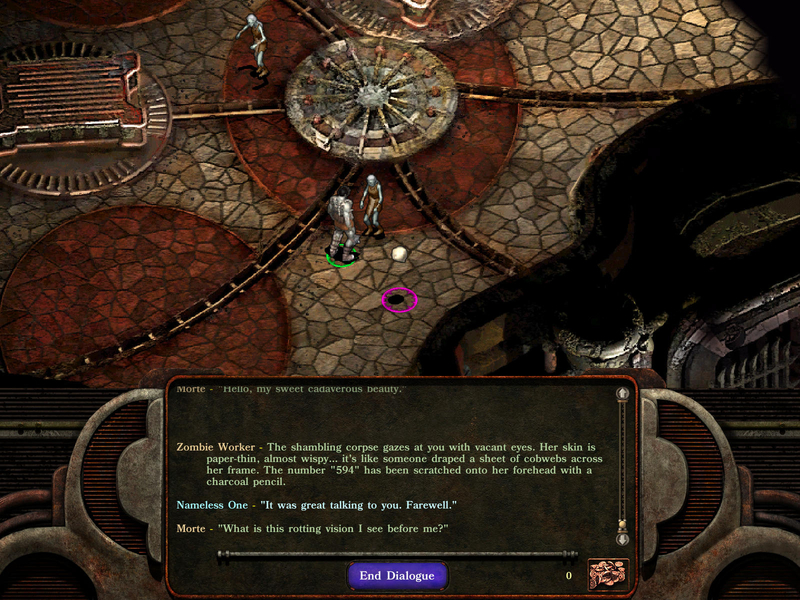 Another 6 creatures are placed based on two unused dialog files, representing customers standing around Deran, the slave auctioneer. Another two characters, laborers working on some strange unidentified device, are restored near where Lenny hangs out. Finally, if you give Ki'ina information that causes her to leave the Lower Ward, she will now return about a week later so that you can enjoy the rest of her dialog that was previously inaccessible. Restores descriptions for bestiary entries of Annah, Dak'kon, Dhall, Dustmen (both male and female), Grace, Ignus, Lothar, Nordom, Trias and Vhailor. It also adds a new alu-fiend entry for Vrischika, that has been improved to match the other bestiary images. Finally, the bestiary image of the TO will change from a shadowy figure to a glowing version after the Nameless One meets the creature in person. Restores guard creatures and some minor treasure to Lothar's abode in the Lower Ward, which are found nowhere else in the game. 19. "Expanded Deionarra's Truth Mod"
This component is not included in "All Recommended PS:T Unfinished Business Components" because it contains a lot more new content than restored content. It adds a great deal of new content (including 180 new lines of dialogue) that will allow the player to find out her fate before it becomes too late to do anything about it. Once the new content has been played, about 30-40 more lines of original dialogue will become accessible. 20. "Restored Item Cheats (Not Recommended)"
This component is also not included in "All Recommended PS:T Unfinished Business Components". It makes two cheat items available to the player and restores their functions: the "Sword of Wh'ynn" - aka "The Cheater's Blade", and "The Tome o' Cheats". Note: PST:EE already comes with a powerful debug console that makes this component largely redundant. I've added the mod to the general mod topic. Made content from Qwinn's PS:T Unfinished Business v4.12 available for PST:EE. Cleaned up and modernized WeiDU code of the mod. Added an improved alu-fiend image intended for Vrischika to the bestiary in PST:EE ("Restored Bestiary Entries"). Fixed a container polygon in the Festhall Private Quarters that overlapped the blocking door polygon. It allowed the player to access the content prematurely, in both PST and PST:EE ("Expanded Deionarra's Truth mod"). Restored a generic acoustic feedback when copying spells to the spellbook in PST:EE ("Restored Party Comments and Banters"). The mod provides countless changes and additions to dialogs, scripts and other game resources, which requires extensive testing. If you find bugs or have any ideas, comments, or criticism, please do not hesitate to post them in this thread. In the original UB according to the readme it takes Able Ponder-Thought 20 hours to complete 1 set of research. In the EE-version however, the first research (about TNO's incarnations) is completed immediately as I can straight away ask him if he discovered anything and he will say 'why, yes, actually. (etc.)'. "CW_Research_Incarnations" should return 1 if he accepted the request, 3 after he told you the result. "Able_Timer_Incarnations" should be a big number. Edit: I was able to reproduce it myself. It's caused by the script parser of PST:EE which seems to be more sensitive than the PST parser. It'll be fixed in the next beta. Fixes the bug reported above by @Doubledimas . It would have most likely affected the "Expanded Deionarra's Truth" quest and some banters between Morte and Annah as well. You should be able to uninstall the old and install the new beta without starting a new game. Thanks a lot for making this, I honestly gave up hope on UB being ported to EE, finally I have a reason to bother with EE. Though I'll hold off from playing it just yet in case more bugs are found. Are new bestiary entries compatible with the portraits in dialogue mod? Good thing Julius brought it up on steam already. People were holding off from buying because of UB not being present. argent77 is the savior! i also gave up on ub being ported [ it's partially the reason i made that comment on the bg2 ub thread.] but it's nice to see it is alive and well. The more players test the mod the sooner I can release a stable version. I haven't tested it yet, but I don't see why it should cause any problems. The new image for Vrischika uses the same mechanism as all the other bestiary images. PST:EE note: For technical reasons the component does not restore individual NPC feedback when attempting to open locked doors and containers. The same applies to copying scrolls to the spellbook. It will restore a generic sound effect, however. What about the sound of Trap detected of TNO and Hannah? I'll make a call for translation shortly, when the mod becomes more stable. There isn't much new to translate. I think that's already included in the base game. I'm aware but I'm not a fan of potentially having to restart a game 10+ hours in because of saves being incompatible or other such issues, sorry. The Italian translation of this mod is a mess and it desperately needs a major revision and overhaul. I will start to work on it once you release the final version of the mod. Ingress' Teeth seem to be bugged. They don't display anything on the "use" button, and pressing it doesn't initiate dialogue. Morte won't equip them, either. Also, I'm having trouble with the new Ratbone - nothing I do in dialogue seems to trigger his quest, although I'm not sure what the actual stat requirements for that are. Good catch! I forgot to associate the dialog file with the new not-yet-usable-by-Morte teeth version. I have also found a WeiDU bug that I have to find a work around for first, or the dialog will terminate prematurely. It will transform the teeth into the version that is usable by Morte. About Ratbone and his quest, I haven't done it for quite a while, so I don't remember the details. I have to look through the dialog files to see how it is triggered. I've never done the pendant of yemeth quest, but people seem to have been complaining about being unable to get it to start for ages. Something seems to be overly fiddly with the requirements for his line of dialogue where Ratbone tells you to bring him 5 cranium rat tails. It just won't appear. Or something. I can't find a detailed synopsis for the quest anywhere on the net. 1) Even when you get his rat tails and get the story from him, you don't get a journal update. Feels quite strange, as you went through a quest just to get a random bit of info unrelated to anything. There's not really a proper "hook" for it so to speak. A random guy asks for 5 rat tails and in exchange he'll tell you... something. 2) This isn't really how quests are done in PST. It's a bit of a glaring convention in the game, but most characters throw their quest right at you. That's more or less what most characters "are" in terms of dialogue, a quest hook line and an exit line, with maybe one or two standard topics in there. This guy's quest hook line is buried way too deep into the conversation, and the conversation doesn't look like it's going anywhere. So, um, would it be possible to tweak/clean up his conversation a bit to make the quest more accessible? I mean, it shouldn't take earning the guys confidence in order for him to ask you to get him rat tails in exchange for what could be a made up story... You ask him about rats, he says they're scarce, he could easily ask you to fork any you've got over to him - he's not got any money to pay for them on account the tails not being worth much, but he sure knows a juicy rumor... Just saying. The Ratbone quest works. You have to ask him about the area and then if there is anything to look out for there. Then he will tell you that there is a rake in the Hive. Keep asking him about that and he will ask for five tails in exchange for more information. But it does not create a journal entry. Just wanted to say that using the console to get the regular teeth doesn't work. Or rather, it does, but then you can't alter them, and the fact that you can't alter them ruins their whole point (which is having a magic weapon for Morte, which then makes it possible to farm Abishai early on if one would want to - just an example of what a difference it can make). What's more, I uninstalled the game, deleted all mods and configurations and tried reinstalling the game and the pack without the Ingress Teeth part and not even this worked. It seems to get messed up even if you specifically chose to skip that bit during installation. I can equip them on Morte, but the "use" button is stuck on the initial dialogue and it can't complete. Fixed Ingress' Teeth to trigger an actual conversation (component "Restored Morte & Ingress's Teeth Banter"). Fixed spellings in French translation (thanks mirandir). Added warning about Modron Maze reset bug to readme. It should be safe to update the mod without having to restart the game. Was Save Nordom a feature of the Tweak Mod? Would it be possible to add journal entries for the new quests? I might do that later, when the mod is stable enough. My first goal is to make the mod fully compatible with PST:EE and fix remaining bugs caused by the differences between PST and PST:EE. The new Carver guy (old Ratbone) is still refferred to as Ratbone by TNO in conversation. Does anyone know how the candlestick quest is supposed to work? So I can playtest it up and down? Thanks. Looks like I haven't ported all Carver-specific stuff over from Qwinn's PS:T Fixpack. Thanks. I'll see if I can add a fix. Yemeth quest: Updated dialogs of the two fiends Aethelgrin and Tegar'in in SCB, so that you can (hopefully) only return the pendant when you made a deal with the fiends before (related to this issue). Yemeth quest: Changed name 'Ratbone' to 'Carver' in Carver's dialog lines. Fixed some typos in the readme. Qwinn didn't add new journal entries to a number of quest, as new content would not be in the spirit of an "Unfinished Business" mod. I tend to agree with him in this regard. Well, the whole Yemeth quest line is a bit unrewarding, since you don't get anything really worthwhile for all your trouble. Qwinn planned (or thought about) to extend the quest a bit and make an involved item more useful, but it apparently came to nothing (possibly because of the same reason mentioned above).